The circumstances in which this tournament occurs consist of three aspects: Firstly, chess is attractive and popular among the general public, which is the premise and starting point for Nanjing to host this tournament. Chess is a sport of intelligence. As one of the oldest gaming sports in the world, chess is as famous as the game of go, Chinese chess and Japanese Chess. Chess enjoys general popularity globally. According to statistics collected by the World Chess Federation in 1990s, there were around 300 million chess fans, a lot of whom were elites. Secondly, the pursuit of harmony in this tournament aligns with the city spirit of Nanjing. During the World Urban Forum 4 and Cultural Industry Fair 2008（Third）Nanjing, China, dialogues and negotiations regarding values have been held revolving about the harmonious development of cities. Likewise, this tournament will intensify this theme through chess art and cultural communication. Nanjing is a famous city with a long history and a great cultural heritage. So, the proper connotation of “gaming, harmony and development” of chess is in line with the city spirit of “enlightenment, open-up, humanity, sincerity, pioneering and innovation” and works in concert with its development orientation of modernized, internationalized, humanistic green city. Thirdly, the event will serve as an interface for communication and a bridge connecting the international community. At present, through continuous mind emancipation and active innovation, Nanjing is striving to lead the new round of scientific development and become a city that is more vibrant in economic development, more brilliant in cultural features, cozier in residential environment and more harmonious in social atmosphere. In the above context, the current tournament is aimed to communicate with the world through high-end sports; actively demonstrate the city image; spread the culture of harmony; and facilitate the innovative development of Nanjing. Under careful consideration of the organization committee, this tournament will be held in Pukou District of Nanjing. As an important place of cross-river development and industry assembly, Pukou is in possession of advantageous biological resources and a great historical and cultural heritage. Now, based on its biological, scientific, educational and cultural strengths, Pukou energetically promotes high-end development for industries and trans-regional development. It makes every effort of become the highlight and landmark in the new round of development of Nanjing. The central idea of this tournament is: gaming stimulating intelligence; win-win creating legends. While the concept of hosting this event is : communicating with grandmasters, intelligent people and the international community; advancing through gaming; merging into internationalization; attracting attention in virtue of international platform; absorbing world cultures and promoting the development of Nanjing and even Pukou, sound and fast. The tournament will take place from December 10th to 22nd, at Mingfa Pearl Spring Hotel in Pukou District of Nanjing. The opening and closing ceremony will be held on December 10th and 21st respectively and the fixture is from December 11th to 21st. Through consultation with World Chess Federation (FIDE) and European Chess Union (ECU), 2008 Pearl Spring Chess Tournament Nanjing, China will become one of the FIDE rating tournaments and it is being applied to be the 4th major chess tournament in the world, coming after Dortmund Sparkassen Chess Meeting, The Corus Chess Tournament and The Linares Chess Tournament. It will also become the biggest chess tournament in Asia and the one and only chess tournament of highest level (Elo rating 2700) in China. The current tournament is organized by Municipal People’s Government of Nanjing and Chess & Cards Administration Center of General Administration of Sport of China; undertaken by People’s Government of Pukou District, Nanjing, and Nanjing Administration of Sport; sponsored by Jiangsu Kanion Pharmaceutical Co., Ltd., Yangzi Evening, and Mundell International University of Entrepreneurship. 6-person double round robin will be adopted. Chess grandmasters including the top 3 players in the world will be invited to participate. 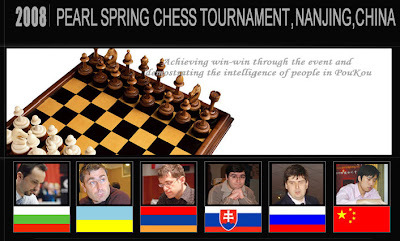 They are Veselin Topalov from Bulgaria (Elo rating 2791, ranked first in the world); Vassily Ivanchuk from Ukraine (Elo rating 2786, raked third in the world); Levon Aronian from Armenia (Elo rating 2757, ranked seventh in the world); Sergei Movsesian from Slovakia (Elo rating 2732, ranked thirteenth in the world); Peter Svidler from Russia (Elo rating 2727, ranked seventeenth in the world); Bu Xiangzhi from China (Elo rating 2714, ranked twenty-sixth in the world). The tournament has received great support from FIDE, ECU and Asian Chess Union (ACU), as well as leaders and communities home and abroad. Guests we have invited are: Kirsan Ilyumzhinov, President of the World Chess Federation; Boris Kutin, President of ECU; Sheikh Sultan, President of ACU and Liang Zhirong, Sectary-General of FIDE. Meanwhile, Xu Jialu, Vice-chairman of the Standing Committee of the National People’s Congress and Nobel Prize winner, Robert A. Mundell will also attend the opening ceremony. Besides the opening and closing ceremony, some cultural activities have also been elaborately arranged. We’ll invite a grandmaster to play in a simultaneous exhibition with Chinese university students in order to further popularize and drive the development of chess. We will also invite well-known experts and entrepreneurs to watch the tournament in Pukou. After the match, we’ll show our players and distinguished guests around Nanjing. Lastly, we’ll organize seminars to deep dive the experience of hosting tournaments and discuss on how to build it into a regular international event.